Illustration courtesy of Mr. Star Guy. The new Vixen (www.vixenoptics.com) 2" star diagonal (Item #5449) is a first class, 90-degree, star diagonal in all respects. It boasts a machined, two-piece body and a dielectric-coated, 99% reflectance mirror. The dielectric coatings assure high contrast, true color and razor sharp images. 2" oculars are secured in the eyepiece tube by a brass compression ring for a secure grip and to avoid scratching the eyepiece mounting barrel. The insert tube has a bevel to better seat the diagonal in the focuser and it is internally threaded to accept standard 2" filters. 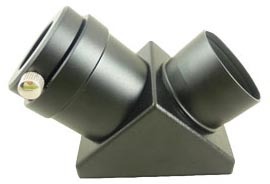 Included with the diagonal is a convenient, CNC machined 1.25" adaptor, also with a brass compression ring to secure eyepieces, and caps for both ends of the diagonal. This diagonal is internally blackened and the insert tube is baffled to minimize internal reflections. The quartz glass mirror is manufactured to a 1/10 light wave optical tolerance. Alignment is tested and verified to be perfect before the diagonal leaves the factory. Distortion is essentially zero. Naturally, it fully illuminates 2" oculars. The external finish is a crackle black body and satin black tubes with a matching satin black 1.25" adaptor. The fingertip eyepiece retaining screws are checkered and chromed. It is covered by Vixen's five year Warranty. The 2011 MSRP is $179. This is not a small star diagonal; any 2" diagonal is much larger than the 1.25" diagonals with which most amateur astronomers are familiar. Sitting flat on its base, as pictured above, the Vixen weighs 0.8 ounce in excess of one pound and measures 3-3/4" tall, 2-5/8" wide and about 5-3/4" long. We used the 2" Vixen diagonal in a Stellarvue SV115T APO refractor and a Vixen VC200L catadioptric telescope with excellent results in both cases. We compared the big Vixen to 1.25" Celestron prism and Astro Tech mirror star diagonals (using 1.25" oculars) and an equally expensive 2" Stellarvue dielectric mirror diagonal (with 2" oculars). Our subjective impression was that it seemed slightly brighter than the Celestron prism star diagonal and perhaps a tiny bit superior to the Astro Tech dielectric-coated diagonal. Its performance was indistinguishable from the 2" Stellarvue dielectric-coated diagonal. (Perfect is, after all, as perfect does.) There was nothing wrong with the views using any of these star diagonals, but we found the quality, construction and performance of the Vixen 2" diagonal extremely impressive. If you are looking for a 2" star diagonal, we recommend this new, state of the art and extremely well made, Vixen. Diagonals literally do not get any better than this. For any scope that will accept a 2" star diagonal, this Vixen can supplant both your old 1.25" and 2" diagonals, simplifying your life while it enhances your viewing pleasure.